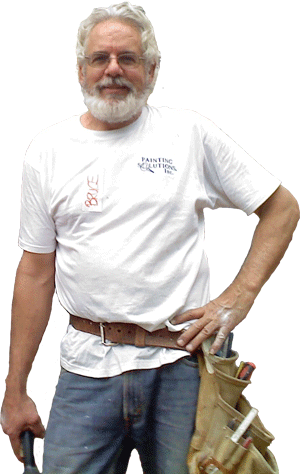 I, R. Bruce Tuttle, am the owner of Painting Solutions, Inc., and painted my first exterior house when I was in fourth grade (when my dad had my brother and me do the work; we were two brothers in a family of seven kids) more than four decades ago. I earned my college tuition painting over the summers. Since then, I have earned a masters level degree, and have well honed my business and technical painting skills since that first job. I have been a home owner for four decades, and also have a number of homes rented out, so there are not many house problems I have not encountered and corrected. I started the company with the goal of giving clients what they want—exploring their parameters to cater the right approach/material/look for them. With emphasis on the plural in the name, Painting Solutions, Inc. aims to give as many options as possible to your needs. Our Solutions leave clients very happy. One of the reasons for our success is our employees who are well paid and incented not only to do a good job for every client, but are managed by me, on site every day. Clients get attached to our friendly employees such that we often hear from them months later. Using our employees on our payroll ensures they will not cut corners producing inconsistent results, be sloppy or be untrustworthy. Copyright © Painting Solutions Inc. All Rights Reserved.